On a different note, Krunal also had some wedding advice for Hardik. The Pandya brothers have made giant strides in their respective cricketing careers in a very short time. While Hardik Pandya has managed to become the first choice all-rounder for the Indian team, Krunal pandya is slowly making his steady rise. The Pandya brothers play for the Mumbai Indians in the IPL. At the MI camp, Hardik is known to be great friends with Kieron Pollard. Time and again, he has called Pollard as his ‘brother from another mother’. 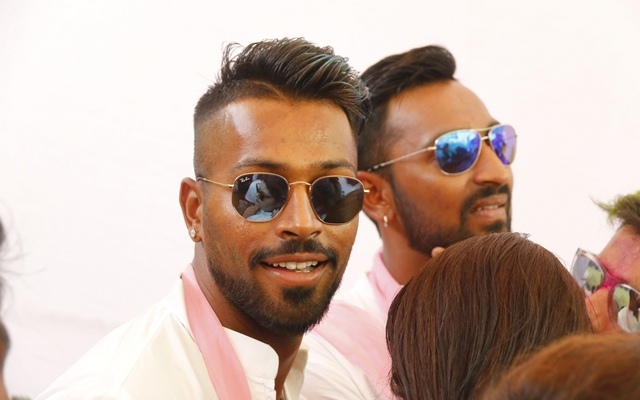 Recently, in an episode of What the Duck, the Pandya brothers spoke at length about their love for the Caribbean players. Hardik remarked that they have always loved the Windies cricketers. Meanwhile, Krunal Pandya cited that even they had dark complexion. Hardik, in particular, was very dark and was often teased by others as ‘black’. “It’s not like that, we are this way after we started playing IPL together. We are like this from our childhood, we love West Indians. There is something in them, they are very chilled out,” Hardik Pandya quoted. “I used to look little less West Indian but he was completely. When someone called him black…our mother used to fight and say he isn’t black. I always used to say, ‘mummy why are you fighting, your son is black and if someone calls him black, they aren’t wrong’,” Krunal Pandya remarked. Speaking more on the same lines, Krunal Pandya recalled a funny incident as well. He recalled that the Kenyan players had arrived in Baroda in 2003. They were not keen on giving their autographs to the young kids. However, when they saw Hardik, they felt even he was a Kenyan national and hence picked him to give their autographs. “In 2003, the Kenyan team came to Baroda for practice before the World Cup.. Kenyan players were waiting for the bus. Hardik looked like a Carribean child and not an Indian. Kids were going to players to get their autographs but no one was giving. Suddenly, they saw Hardik and among all, they gave their autographs to him because they thought that Hardik was from their hometown. They were like get this boy first, let us give him an autograph,” the senior Pandya recalled. On a different note, Krunal had an advice for Hardik on ringing the wedding bells. He asked Hardik not to marry before he turns 40. He hopes to see Hardik grow up before settling down. “Regarding marriage, I want to give Hardik just one advice ‘don’t get married’. You can do it later, maybe in your forties.. till then you just see, as they say, ‘grow up’, ” joked Krunal. For the latest cricket news, follow CricTracker.